Additional public gardens to note around New England. [extra: Extra] View additional images of New England's best public gardens. New England may not be widely known for its public gardens, but those that do grow here inspire passion in the hearts of hardy-zoned green thumbs. The Glebe House, for example—the Connecticut birthplace of the Episcopal Church in the New World—also boasts the only extant American garden designed by Gertrude Jekyll, whose impressionistic style turned landscapes into flowing paintings. The other side of the state offers the Gothic Revival-styled Roseland Cottage (owned by Historic New England), with its vibrant mid-nineteenth-century boxwood-edged parterre gardens: “an elaborate, rather rare place, planted beautifully,” according to gardener Alan Emmet ’50, RI ’77, who wrote the authoritative So Fine a Prospect: Historic New England Gardens. For example, he says the greenhouses at Wellesley and Smith Colleges are “better than a ticket to Jamaica!” The Wellesley College Botanic Gardens has 16 of them (in addition to its arboretum and other artful landscapes). The spaces include sections devoted to succulents and desert plants, a fine array of unusual ferns, and tropical and subtropical trees and flowers, along with an orchid room and the 130-year-old Durant camellia, which came from Wellesley’s founders, Pauline and Henry Fowle Durant, A.B. 1841. An entire “camellia corridor” is walkable at The Botanic Garden at Smith College, as is an invitingly humid palm house, with coffee, banana, and cacao plants. The Australian fern trees are also worth a visit, and the college’s annual spring bulb show (March 2-17) is a popular tradition. When the snow is gone, Swain urges a trip to discover “all the early bloomers, the spring ephemerals, the marsh marigolds, and skunk cabbages and other lovely early signs of spring” at the Garden in the Woods (home of the New England Wildflower Society in Framingham, Massachusetts). Enchanting pathways wind around various habitat displays, such as bog and swampland plants, meadow flowers, and an inspiring rock garden. Visitors can also take longer loops through woodlands and over the Hop Brook. Later in the season, fans must get to “the best new public garden in New England—the Coastal Maine Botanical Gardens,” Swain avers. 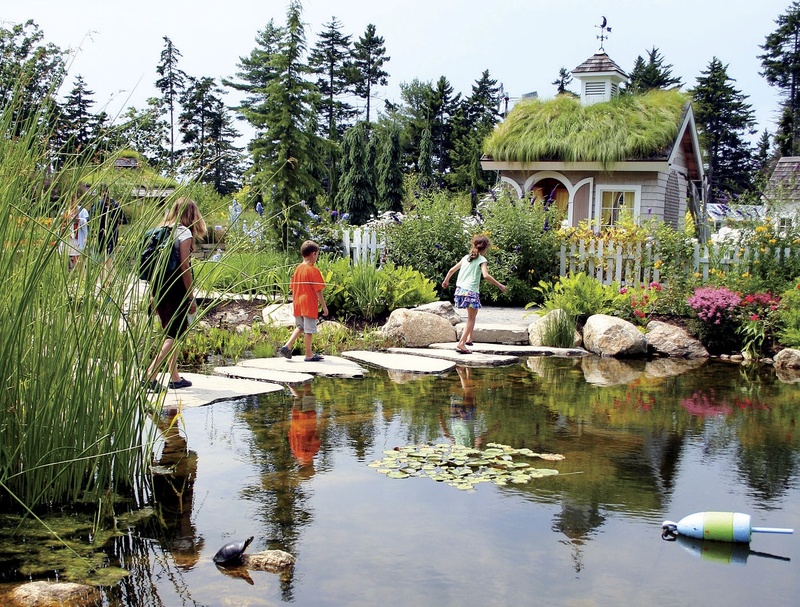 More than 10 meticulously designed garden spaces have already been created on the organization’s 248-acre tract in Boothbay; all are open year-round. Classes, dinners, and other events are available (although the buildings are closed from December through March). Miles of walking trails wind along the shoreline, through the mossy woods, and past small ponds. The gardens opened in 2007 after 16 years of planning and planting by hundreds of volunteers and a core group of residents, some of whom mortgaged their homes to help raise money for the ambitious project. “It’s a very creative and whimsical place for people of all ages,” says marketing director Kris Folsom. 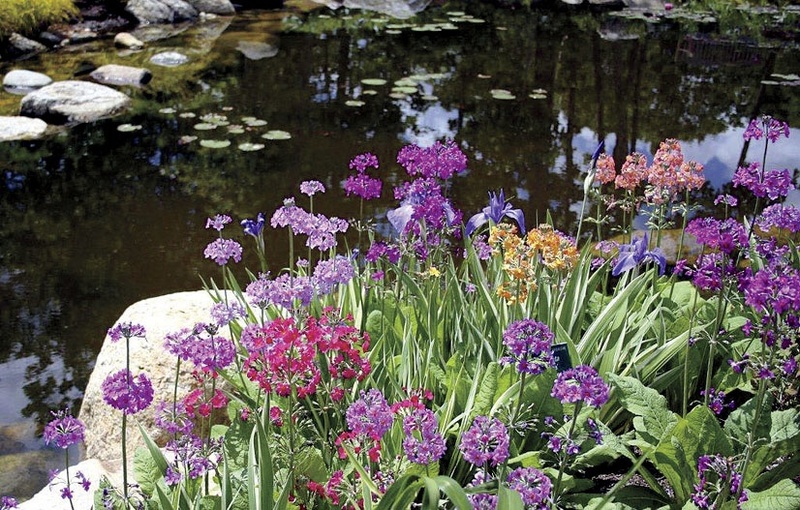 The 132-acre Tower Hill Botanic Garden in Boylston, Massachusetts, is another dynamic year-round destination—especially for those seeking ideas and inspiration for what they can accomplish at home. Various kinds of gardens (e.g., vegetable, winter plantings, and evolutionary) are on display, and woodland trails lead to diverse locales: a wildlife refuge pond and a mid-eighteenth-century English-style managed woodland with native species, a folly, and a Greek “temple of peace.” Two glass houses, the Orangerie and the Limonaia, help take the edge off New England winters with citrus trees and blooming camellias, calla lilies, and bird-of-paradise flowers—along with other nonhardy plants from around the world. “People tell us their stress level decreases as they come up our driveway,” says marketing and public-relations director Michael J. Arnum. “Tower Hill is a rejuvenating place, an oasis.” As the home of the Worcester County Horticultural Society (founded in 1842), Tower Hill is also an educational wellspring. The library is open to the public, as are concerts, classes, workshops, art exhibits, and flower shows, such as those coming up on African violets (April 20-21) and primroses and daffodils (May 4-5). “The systematic garden is a lovely introduction to what’s related to what—a teaching tool,” Roger Swain declares. “Worcester gets lots of credit for its teaching and shows.” But his favorite part of Tower Hill is the antique apple orchard. The garden purchased its first acreage from a dairy farm that also had an orchard, which has been nurtured and now includes 238 trees—among them 119 varieties of pre-twentieth-century apples. (Samples are available on Columbus Day weekend, but enthusiasts can order scionwood—cuttings from a tree—for grafting to their own trees and look forward to edible fruit.) Picnics, with wine and beer drunk in moderation, are allowed, or visitors can eat at the in-house Twigs Café, where food is served indoors or on a stone terrace with views of the Wachusett Reservoir. To understand the depth and beauty of a 30-year collaborative artistic passion, visit Naumkeag, a National Historic Landmark built by McKim, Mead & White for lawyer and diplomat Joseph Choate, A.B. 1852, LL.B. ’54, A.M. ’60, LL.D. ’88, and his family in 1885. 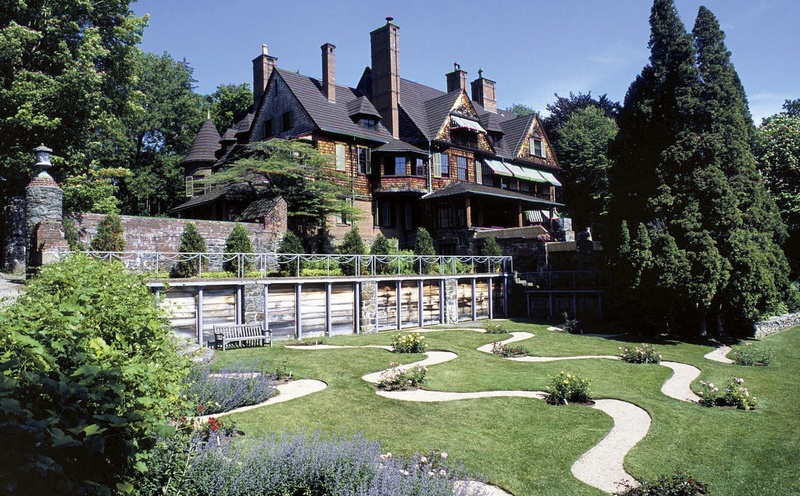 Now owned by the Trustees of Reservations, the Gilded Age, 44-room house in Stockbridge, Massachusetts, is open to visitors from Memorial Day to Columbus Day, but the grounds alone, with their current designs by Fletcher Steele (who took landscape architecture classes at Harvard) in partnership with Choate’s daughter, Mabel (who also studied garden design), offer lessons in grace, harmony, and scale. “They ended up creating an amazing monument to twentieth-century landscape design,” says Mark Wilson, the Trustees’ west region cultural resources manager. The two worked on realizing their vision from 1926 until 1956; Mabel died two years later, bequeathing the property to The Trustees. Now a $2.6-million restoration of their work, which has deteriorated somewhat over time, is under way. “We have a five-fountain system and an 80-year-old piping infrastructure, with over eight acres of long-running pipes,” Wilson says. “We have to look at sustainability and isolating some of that water.” (Fundraising is in progress to match a $1-million challenge donation.) Meanwhile, everything is still open and operating for visitors. Coastal Rhode Island offers another, very different, example of a grand old house and gardens. 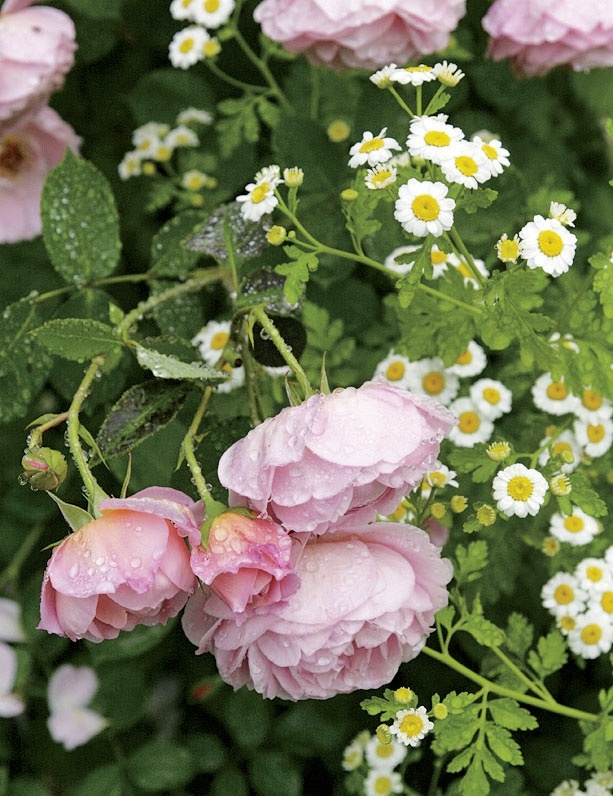 “Blithewold is an early-twentieth-century place with wonderful old trees and roses and a beautiful setting on the Narragansett Bay,” says Emmet, who particularly loves its old-fashioned rose varieties. (Hybrid roses, she says, “hold no romance for me.”) Inspired by the English Manor style, the stone and stucco mansion with steeply pitched roofs sits at one end of an elegantly graded, 10-acre lawn that sweeps down to the water. 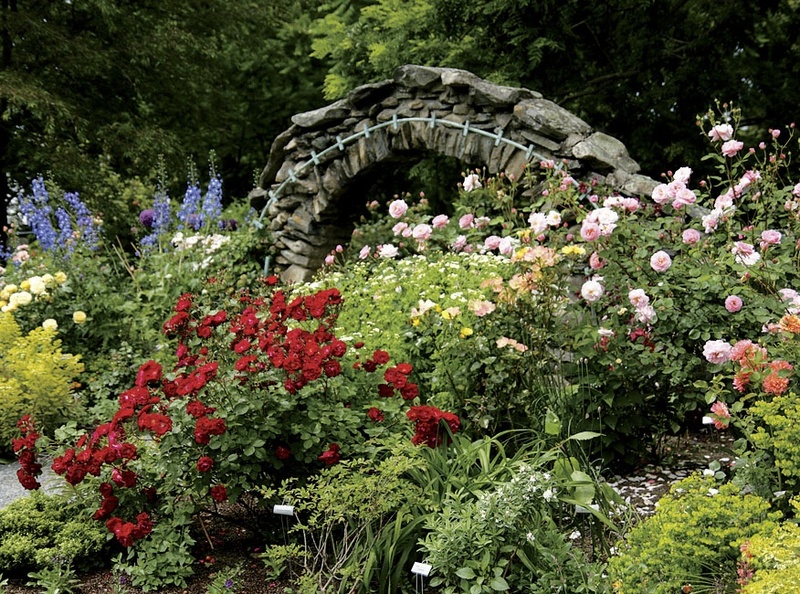 The entrance garden features 100-year-old climbing roses and dozens of shrub roses, including modern cultivars, as well as annuals and perennials, such as complementary blue and purple delphiniums and lavender—all immaculately maintained. The chestnut rose, with its thousands of pink blossoms, is among the largest in the country. The roses peak in mid June, with another round in late summer, but the house and grounds, open year-round, are worth touring any time. Bessie Van Wickle (later McKee) was an accomplished horticulturist who hired landscape architect John DeWolf to help realize her dream of creating a gardener’s paradise. She and her daughters, Marjorie and Augustine, lived at Blithewold at least half the year, from 1896 until the death in 1976 of Marjorie, who also gardened actively and developed the estate, now owned by the nonprofit Blithewold, Inc. 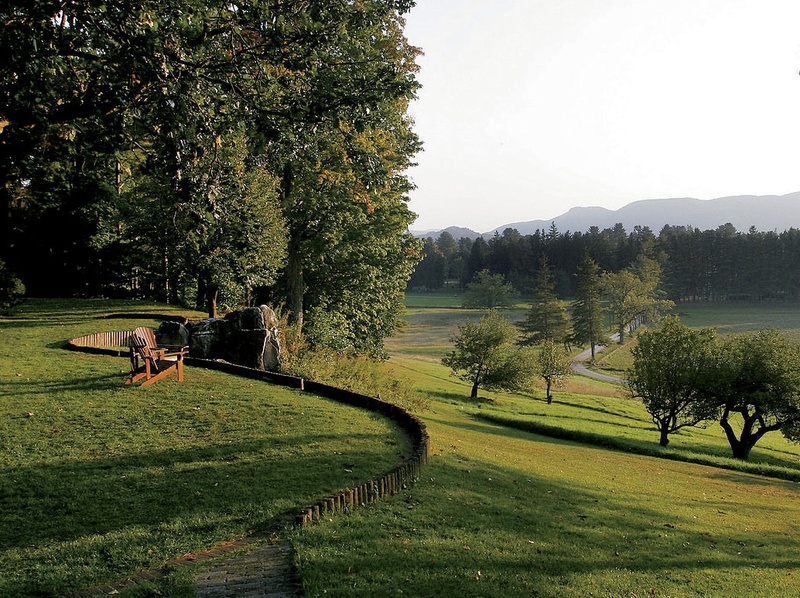 The 33-acre property is also known for its 1,500 trees and shrubs, including rare specimens and a century-old sequoia. Willows, cottonwoods, and Japanese maples surround the 1920s water and rock gardens, where a man-made pond is home to wildlife. Stone walls and a bridge add heft, while English yews and Eastern red cedars planted long ago also help shield tender plants from the coastal winds and salt sprays. The delicate task of managing the plantings, increasingly vulnerable to both storms and drought, holds lessons in climate adaptation for gardeners everywhere.